Whether it's fried chicken or pimento cheese, fruit salad or meatloaf, everybody's family does it a little differently. The Southern Bite is a celebration of those traditions and recipes every Southern family is proud to own. It's the Pecan Chicken Salad that's mandatory for every family reunion and the hearty Goulash, so comforting after a long day. It's the Glazed Ham that makes its way to the Easter table every year. 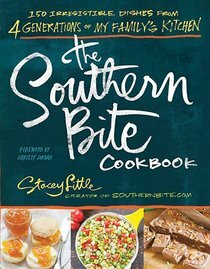 About "The Southern Bite Cookbook"
Stacey Little is a Southern food blogger. His easy, delicious recipes and heartfelt stories have brought millions to his blog, SouthernBite.com, since he created it in 2008. Stacey's deep Southern roots have him firmly planted in central Alabama, where he lives with his wife, little boy, two dogs, and his collection of cast iron skillets.